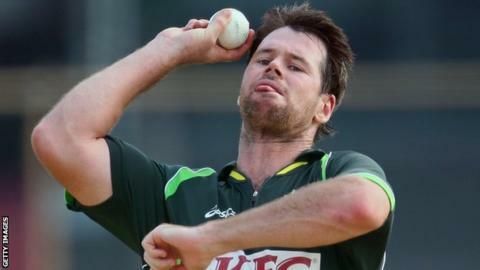 Middlesex have signed Australia all-rounder Dan Christian for this season's T20 Blast competition. The 30-year-old, who has played 15 Twenty20 internationals and 19 one-day Internationals, will be available for the entire group stage. "We are delighted to have attained the services of an experienced, talented and dangerous cricketer" said managing director of cricket Angus Fraser. "We believe Dan will offer experience and match-winning performances." Sydney-born seamer Christian has played 125 T20 matches in total, taking 106 wickets at an average of 27.59 and scoring 1,644 runs at 20.55. He made his T20 debut for Australia in 2011 and featured for his country in the one-day series against England this winter and at the World T20 in Bangladesh earlier this month. Christian helped Hampshire win the domestic T20 title in 2010 and played for Gloucestershire in last season's competition, taking four wickets and scoring 113 runs in 10 matches. The right-hander has previously represented Deccan Chargers and Royal Challengers Bangalore in the Indian Premier League and Brisbane Heat in the Big Bash competition in his homeland. Meanwhile, Middlesex all-rounder Gareth Berg has had keyhole surgery on his right shoulder which uncovered an abscess. The 33-year-old South Africa-born Italy international will be treated with antibiotics for two weeks and then his condition will be reassessed.